ZOOMING over pit 18 and 25 at Dawson South coal mine, it's hard to believe the sites were once bustling coal mining sites. 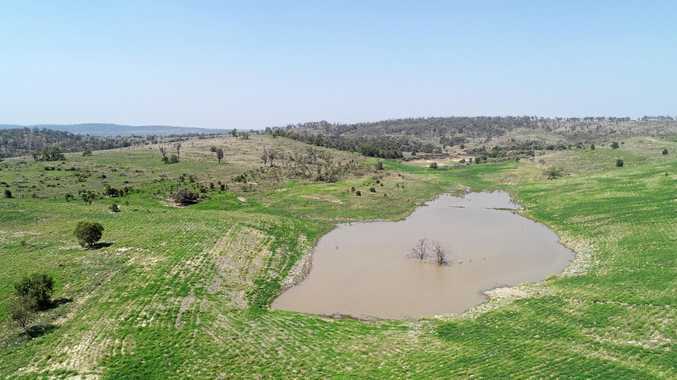 Drone footage released by mining giant Anglo America Australia has shown the transformation of the sites from barren holes in the ground to productive agricultural land. After the success of the rehabilitation projects, the major mining firm plans to invest $162 million rehabilitating a further five central Queensland metallurgical mine sites. As part of a "progressive" sustainability goal, the company's Dawson and Capcoal open cut mines will receive the lion's share of the cash, pocketing about $83 million and $40 million respectively. Anglo American's underground Grasstree, Grosvenor and Moranbah North Mines will also undergo extensive rehabilitation works funded by the remainder of the cash. When rehabilitating pit 18, Anglo America pioneered the use of blasting techniques to successfully reshape void highwall into final landform position. Pre- and post-blast surveying was undertaken to provide accurate estimates of how much reshaping and material was required for final landform. Four blasts were required to complete the project, which moved considerable amounts of highwall material into final landform position. Following reshaping, the area was seeded with a grazing mix of native and introduced species. It was then treated with five tonnes per ha of Gypsum in 2017 and re-seeded. Anglo Amercia were expected to use the same blasting techniques in their new rehabilitation projects. "The successful rehabilitation of the (pit 18) area has demonstrated the technique can be applied to reshaping mining voids - one of the most challenging aspects of rehabilitation for the industry - and rehabilitate land for productive post-mining use," a company statement said. Anglo American metallurgiacal coal business CEO Tyler Mitchelson said the company was committed to maintaining high environmental standards and would continue to pursue mine rehabilitation efforts. "Anglo American's Dawson Mine has been leading the way in innovative rehabilitation approaches, including the successful rehabilitation of an area previously containing void highwall, and use of rehabilitated land for cattle grazing," he said. "We continue to innovate and pursue best practice mine rehabilitation across our business. "In partnership with emapper, other miners and industry suppliers, our Dawson Mine has also been part of an innovative METS Ignited (the Federal Government Growth Centre for Mining Equipment, Technology and Services) project using drone technology to aerially map rehabilitation areas. "Rehabilitated areas at our Dawson Mine cover more than 1,800 ha so this project is a significant step forward in improving the safety, efficiency and accuracy of our mine rehabilitation monitoring programs." Mr Mitchelson said results at pit 18 at the company's Dawson mine was an example of this. Anglo American's environment manager Jason Fittler said the company's goal was to leave safe, stable and non-polluting land forms. "We are committed to the highest environmental performance in terms of meeting our social license to operate and also our commitment to stakeholders," Mr Fittler said.